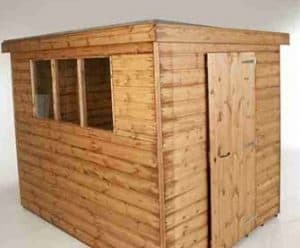 With a very attractive design and also a whole lot of storage space, the 10′ x 8′ Traditional Standard Pent Shed is one of the most impressive, large sized sheds from Treetops Traditional. From the outside the shed looks great thanks to the good looking wall cladding, three fixed windows and also a very high quality door that comes with a lock. Inside there is a very impressive, 10 x 8 floor space for you to make use of. This kind of room allows for many things like a whole load of gardening equipment and tools or maybe even the kids bikes and outdoor toys. The size of the shed would actually allow you to use this as a pretty spacious workshop as well. In designing the shed, Treetops Traditional made sure to only use the highest quality materials. This starts right at the top as the roof is made with some very impressive tongue and groove boards. The flooring is actually made with these same boards so that is strong as well. The whole structure has a very robust nature to it thanks to being made with tongue and groove shiplap cladding which covers an impressive, round edged frame. 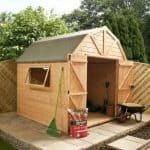 This is a shed which has managed to mix strong design and good looks very well and it’s laid back style allows it to easily blend into any garden. Treetops Traditional have been releasing a steady flow of very impressive looking sheds and this is another very well designed one from them. One of the things we love about this shed is the choices it gives you in its design and while the pictures show a slightly different sized shed than this one they do give you an idea of the way you can make this look. Inside the shed you have what we consider to be a very generous amount of storage space with 10 feet of width and also 8 feet of depth. One thing that we like about the sheds from Treetops Traditional is how they always make sure the roof is nice and high. The high point is a very impressive, 6 feet 4 inches and even at its lowest the shed is 5 feet 11 inches high. The pent roof has been very cleverly designed so that it offers you protection against the weather and also look good in the process. 12 mm thick tongue and groove boards are used to make up the roof. These are strong boards which thanks to the angle they are at will force the rain to always run off them. Protecting these boards is felt which can take a lot of abuse from our British weather. The 12 mm tongue and groove shiplap cladding which makes up the walls of the shed has a very interesting look. We feel that it has that classic shed style to it so it really is going to be able to blend into any type of garden. While we do love the style of this cladding the way it keeps your belongings dry by not allowing any water into the shed is just incredible and it will also make you feel confident in storing more expensive items in here. No matter how many times we see that tremendous, 44 mm x 27 mm round edged frame from Treetops Traditional we are always blown away. This is something we love about the sheds from these guys as it makes any structure it is in that extra bit solid and reliable. This frame is so well designed that the shed 20 years after construction will be just as sturdy as the day it was put into your garden. Flooring can make or break a shed in our opinion. There is nothing worse in a great looking shed than a floor which feels weak. Well thanks to being made from 12 mm tongue and groove boarding this floor is very strong and just perfect if you plan on keeping heavy items inside the shed or even if you think you will be spending quite a bit of time in here yourself. Treetops Traditional do give you a free basecoat treatment, but shortly after you have built the shed you will need to give it a full coating of wood treatment to protect that gorgeous wood. This type of wood does require an annual coating of treatment in order for it to last many years. 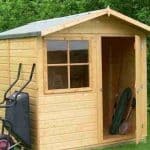 In order to give you peace of mind, you will get a one year guarantee with the shed which will cover you in the rare case the wood shows any sign of rot or if there is some kind of fault with the materials. The standard door that comes with this shed is a single door which is 5 feet 5 inches high and 2 feet 8 inches wide. 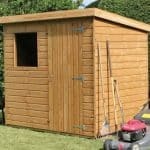 This is average for a shed of this size and getting in and out with larger items should not be too much of a challenge. One thing we really like about this door is how high quality the hinges are so the door will keep in its place. The door can be positioned in a number of positions on the shed so think about that before you order. One really great thing that is on offer with the 10′ x 8′ Traditional Standard Pent Shed is that you can have the door changed so that it is a stable style door. Also speaking of changing the door, for and extra £53.99 a double door can be included. There are three fixed windows with this shed all of which are made with very tough, horticultural glass. As we mentioned just above the door position can be changed, but in doing so you may lose a window or need to have one or two relocate to a gable end. The key operated lock which is on the door keeps the shed locked up very securely and the robust nature of the shed in general means that this is one very secure and long lasting structure. While we think that the lock is more than enough to keep things secure, adding a pad bolt and padlock would not be hard or expensive. The windows do make it easy to look inside the shed, but a classy set of blinds or even some jazzy looking curtains would take care of this. One other way to give yourself some privacy, which may be a bit extreme for some. Is to order the shed fully boarded so that there are no windows included at all. We love the way that you can have some fun by changing the style and size of the door, its position, which then leads to the windows changing their position. As you can see in the pictures this is a shed which can look great in many different ways. Of course we already talked about the double door as an extra, but there are a few others to consider as well. First of all those windows can be changed so that they can open. The cost of this is a fairly reasonable, £31.99 per window. If you want to give the floor a little bit more strength then there is a fantastic set of wooden floor bearers which can be added at a cost of £52.99. The last extra that is on offer is their installation service which at a cost of, £114.99 will see them build the shed for you. We always expect any shed from Treetops Traditional to be of a very high quality and this one here did not disappoint us at all. 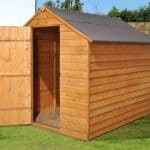 The materials of this shed are very long lasting in their nature, but they do require a little help from you. Annual treatment is needed to protect the wood from the elements and prevent rot. 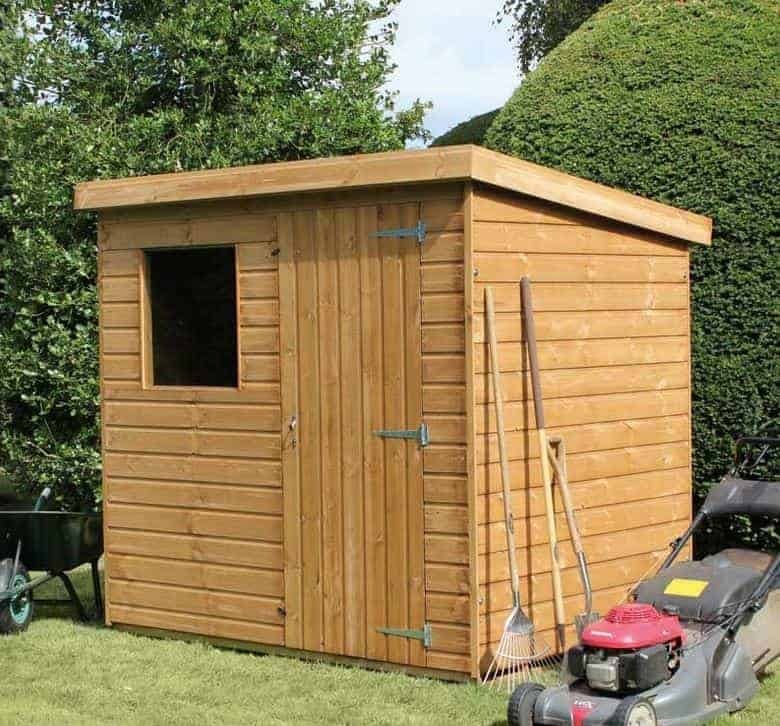 10 x 8 is always a great size of for a shed in our opinion as it gives you lots of room to use, but at the same time it is not too large so that very few gardens can handle it. This is a two person DIY job and Treetops Traditional say it will take 3 to 5 hours to install. We feel this is about right and as long as you remember to take the odd coffee break and actually follow the instructions then building this will not be much of a hassle for you. This is a high quality shed, but it does have what we are sure many will feel is a high price tag. Still we do feel that as the materials are top of the line that the price is actually very fair. Final Thoughts: No matter what position you have the door, where the windows are placed or even what colour of wood treatment you use, the 10' x 8' Traditional Standard Pent Shed is a structure that just oozes style and class. We really like this shed as it is very well made with some very impressive materials and it also offers a whole lot of storage room. 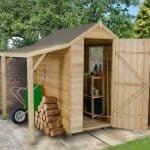 The shed would be ideal for a person who has loads of tools and gardening equipment that they want to keep safe and organised. It would also work well as a family shed to keep bikes and stop you tripping over fire trucks and other toys that are always left on the lawn.